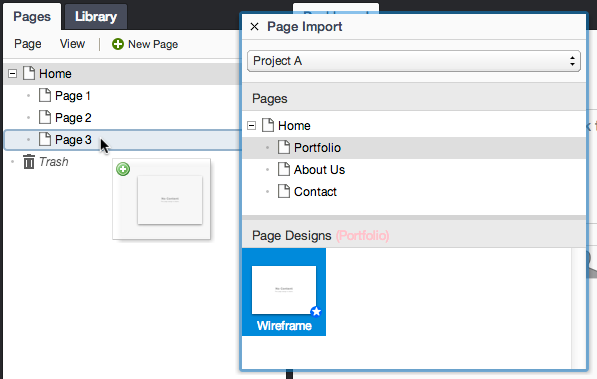 ProtoShare allows you to copy designs between projects. In ProtoShare, this is called “importing” the designs. Importing designs allows you to easily copy a small set of designs from one project to another. If you want to copy a larger set, it may be easier import an entire page, or duplicate the source project, and then remove the items that you don’t want. Note: When importing a design, ProtoShare automatically detects any library items, such as templates or assets, that are used on it and imports them as well. Styles from the source project’s style sheet are not imported, though. Find the location in the Pages or Page Designs panel where you want place the imported design. Find the page that contains the design you want to import, and select it. The selected page’s designs are listed in the area below. Find the design you want to import, drag it from the page import window, and drop it in the location you chose in step (2).